Last Tuesday, as part of my on-going series on throwing a cheap and easy DIY Western Party, I shared how to make these cute and easy invitations for 50 cents a piece. 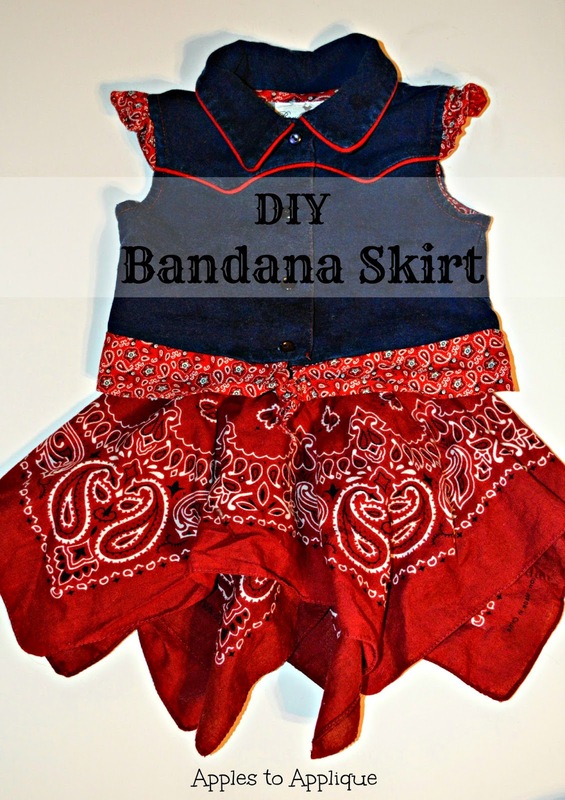 Today, I want to share with you all how I made the bandana skirt my daughter wore for her first birthday party. This skirt was so quick and easy, I was finished in under an hour--hence the inclusion in Two-Minute Tuesday. :) Honestly, a good portion of that hour was spent rethreading a serger I wasn't super familiar with, so I bet you could knock this out much faster than that! As I was brainstorming about what to have my little girl wear for her party, I got the idea of making a bandana skirt. 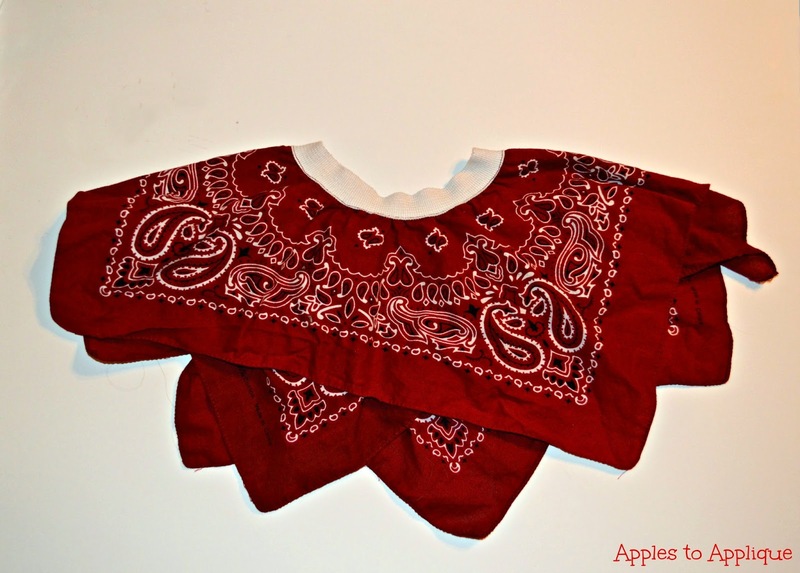 There are lots of different types of bandana skirts out there, but I wanted a simple one that only used two bandanas set at an angle with a hole cut in the top (center) to form the waist. Well, wouldn't you know it, another blogger had already had the same idea! I found a great tutorial here from Delicate Construction. I followed her advice and used this handy tutorial from MADE to figure out exactly how big to cut the circle for the waist. What a lot of time and headache saved! Essentially, I cut a hole in the center of two bandanas, stacked them off-kilter from one another, and serged them together along the raw edge of the circle. Sorry for the lack of pictures; I'll refer you again to the tutorial from Delicate Construction for pictures and more detailed instructions on this process. I sewed my elastic ends together and stitched the elastic onto the circle waist. I did take a picture of the finished project at this step, because I felt the original tutorial wasn't quite clear on how exactly to attach the elastic (or maybe I just need more detailed explanations than most people--ha!). I just overlapped the elastic about 1/4" over the right side of the skirt and topstitched it down, stretching the elastic as I sewed. That's all there is to making a bandana skirt! Can you believe it? And the finished project is so adorable! I was going to make my daughter some type of shirt to wear with it, and then I totally lucked out and found this darling shirt at Goodwill for $1.99! Sometimes things just go your way. Seriously, how perfect is this shirt for a western party? And there's no way I could make one like it for the price. It went just right with her bandana skirt! Here's my cute little cowgirl in her birthday get-up. Liked this post? You might also enjoy my daughter's western party overview, cheap and easy DIY western invitations, and this FREE printable western pennant banner. Make sure you don't miss out on upcoming posts in this series on throwing an inexpensive DIY western party! Subscribe to my e-mail list and follow me on social media; the buttons are at the top-right corner of my blog. Thank you! What a cute idea.. She looks like she is ready to ride with that outfit! This is too cute and so festive! now you make this look really really easy! I love the outfit... different and cute! What a cute look outfit! Very smart and creative. 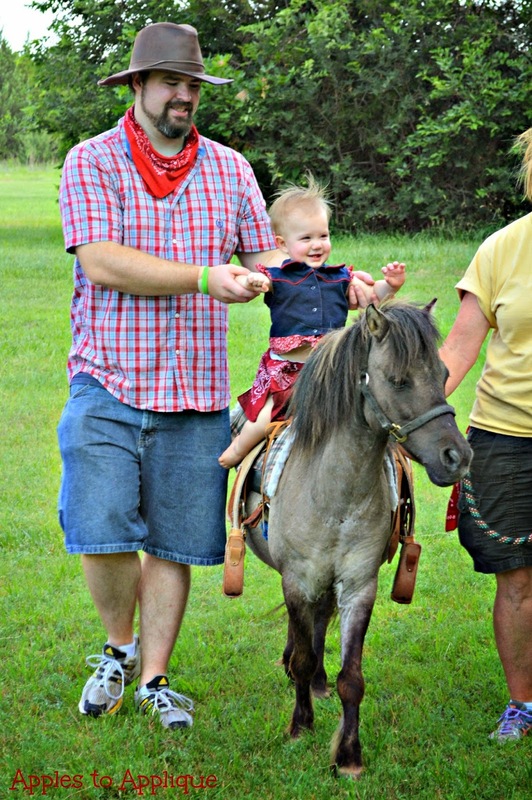 That was a really cute idea, and perfect for the cutest little cowgirl. This is adorable! I cant wait to make it for my daughter this fall, it will look so cute for our farm trips! I want one! That would be a lot of handkerchiefs though. So adorable. I'll have to show my niece this. Awesome idea! What an awesome DIY!! I love the results. Who would have thought you would be able to create such an funky skirt out of just handkerchiefs.